The heterogenous nature and clinical behavior of prostate cancer (PCa) requires intensive research on different aspects of the disease for better understanding and monitoring. Our aim is to investigate noninvasive urine specimens, obtained after digital rectal examination (DRE) in suspected PCa patients by a combinative molecular panel of PCA3, TMPRSS2-ERG fusions and GSTP1 promoter hypermethylation for early diagnostics. Furthermore we tested urine specimens for a presence of high-risk Human Papilloma Viruses (HPV) as an inflammatory cofactor in the complicated origin of PCa. A total of 44 patients with elevated PSA and/or physiological symptoms of PCa were analyzed. 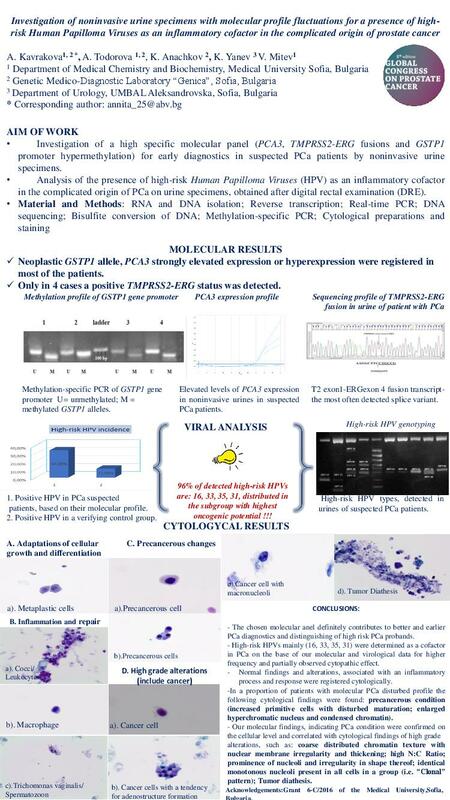 Real-time RT-PCR, DNA sequencing, bisulfite conversion of DNA followed by PCR, cytological preparations and staining were applied. Fluctuations in the molecular profile were registered in most of the patients: neoplastic GSTP1 allele, PCA3 strongly elevated expression or hyperexpression. Only in 4 cases a positive T2-ERG status was detected. High-risk HPV types were detected in 34,09% of our urine specimens, obtained from patients at high risk of PCa based on their molecular profiles. Approximately 96% of detected high-risk HPVs are: 16, 33, 35, 31, distributed in the subgroup with highest oncogenic potential. The estimated frequency of high-risk HPV types in urine in control male samples with urothelial infection is significantly lower (11%). The pathological findings on cytological slides from high-risk HPV positive urine specimens were described in detail. The pathological examination was focused on the presence of inflammation, variable adaptations of cellular growth and differentiation, and mostly on precancerous changes (increased primitive cells with disturbed maturation and abnormal differentiation, squamous epithelial cells with well determined perinuclear halo, indicating viral cytopathic effect), features of high-grade lesions (enlarged hyperchromatic nuclei with nuclear membrane irregularity and thickening, scant cytoplasm and high nuclear-cytoplasmic ratio, nuclear margination, prominence of nucleoli and irregularity in shape, mitoses - particularly abnormal, pleomorphism, noncohesiveness and tumor diathesis). The study concerns novel data for Bulgarian PCa suspected patients reported for the first time. Future perspectives: Studying of p16ink marker for the influence of high-risk HPV on the prostatic cells. Acknowledgements: Grant 6-C/2016 to Medical University, Sofia, Bulgaria.